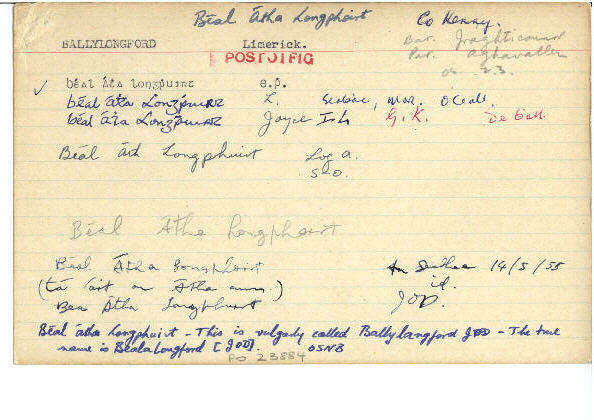 n/a · Nóta Cárta Béal Átha Longphuirt Joyce I 4 Béal Átha Longphuirt – “This is vulgarly called Ballylangford” - JOD “The true name is Bealalongford” [JOD]. n/a · Nóta Archivium Hibernicum 1427 (7) Eadem die (8 Aprilis) Tatheus Okynneld, principalis, obligavit se Camerae, super annata perpetuae vicariae Achmalynd Artifertensis… Refers to the parish of Ballylongford at the moth of the Shannon. The older name was Aghavallan (Áth-a’-mhalann). The family name of Kennelly (Ó Cinnfhaolaidh) is constantly associated with this parish and locality. They were a branch of the Uí Fidhgheinte in co. Limerick until dispossessed by the Fitzgeralds and other Norman settlers. The name of the rectors does not appear but the advowson of the vicarage was held by the Augustinians of Rattoo (FE 6034). The mandate in CPL, vii. 483 corresponding to this annate informs us that Thady O’Kennelly’s father, Maurice, a priest, had continued to hold the vicarage of Aghavallan unduly for more than eight years. See Limerick annates no. 39, Arch. Hib., x. 118. · RIA Cat. "Diarmuid Ó Séighe, sagart oirdhearc bhi a bparoiste Béal Átha an Longphuirt a n-Oirecht Uí Chonchubhair"
· Ardf. Wills, 151 "Stack, Rickard (carpenter), Ballylongford, co. Kerry"